Thanks, Mail Carrier | Pregnant or Not? 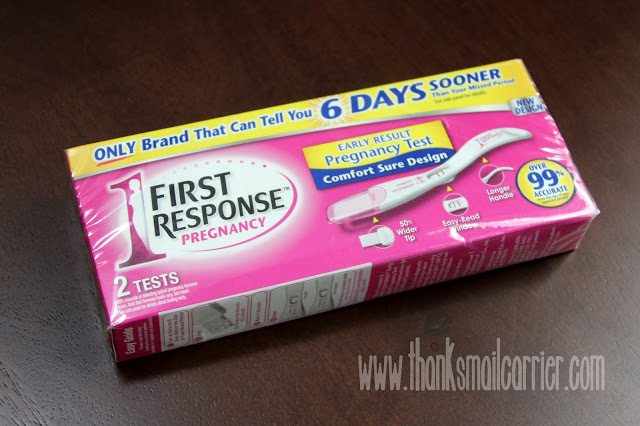 Find Out with the Newly Redesigned First Response Early Result Pregnancy Test! Pregnant or Not? Find Out with the Newly Redesigned First Response Early Result Pregnancy Test! Usually when it comes out that my husband and I tried for a full year to get pregnant before we conceived Big Sister E, people are surprised. But honestly, I was surprised it took that long, too. I felt like everything I had ever been taught or learned in school (or from teen dramas and soap operas) pointed to the fact that the moment you didn't use protection, bang! Pregnant. So how in the world was month after month going by and I wasn't knocked up? Yet each time I would continue to get my hopes up, only to have to wait the agonizing number of days until I could pull out a pregnancy test, wait until morning ("first urination of the day," I believe they called it), and deal with the awkward, somewhat-gross experience of using it. Obviously I eventually received the shock and elation of seeing the two pink lines appear and, fast forward to today, I wouldn't change a thing if it meant not having Big Sister E or Little Sister B in our lives. However, if there was a way that I could have gotten the thrill of uncovering a positive pregnancy test result sooner while also avoiding the troublesome and not-always-sanitary moments that come with a home test? Let's just say that I would have definitely reached for First Response's newly redesigned Early Result Pregnancy Test! There is no doubt that pregnancy testing has changed drastically over the years. Whereas once they were only analog, now there are digital tests. Instead of the only option for detection being after your missed period, now tests can give you answers before. The advancements are numerous and have made life easier for women everywhere! But now First Response, the only category leader able to detect pregnancy six days before a missed period, has redesigned their advanced Early Detection Pregnancy Test to make it even better (and a bit less troublesome). There really isn't anything not to love about this newly-engineered "Comfort Sure Design" test stick! First, the Comfort Sure Design updates the original flat stick into a curved shape with a longer handle that is designed to fit a woman's hand and includes a 50% wider tip. I have heard more than one story from women that have accidentally dropped their pregnancy test right into the toilet, so I'm sure these changes will help lessen that! Second, the easy-to-read results appear in only three minutes with over 99% accuracy from the day of the expected period. No extended torture waiting for those two pink lines or wondering if what you see is accurate or not! Finally, this FDA-approved pregnancy test is designed to detect all relevant forms of urinary hCG (human chorionic gonadotropin) throughout pregnancy, meaning it can be used anytime of the day as opposed to only first thing in the morning. 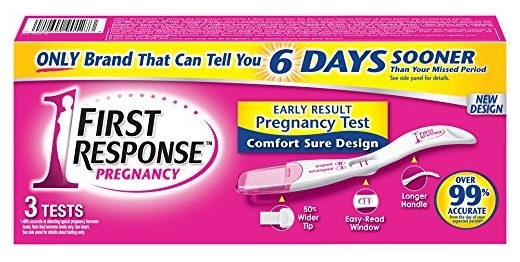 In short, these new additions to this already-great product really make the First Response Early Result Pregnancy Test stand out far above any other home pregnancy test in terms of early detection, more control and less mess! Retailing from $8.99 - $15.99, the First Response Early Pregnancy Test is available now at all major drugstores, mass and grocery stores so you know you can always head to your nearest Walgreens or CVS! Whether you are planning on becoming pregnant, are wondering if you already are, or simply want to be prepared for the future, find out more about the newly redesigned First Response Early Detection Pregnancy Test (and how it would make testing easier and more enjoyable) by visiting FirstResponse.com.